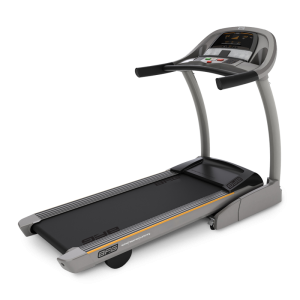 The AFG 5.1 AT treadmill is loaded with quality treadmill features such as a large motor, big deck, and a 15% incline range. For treadmill purists, it focuses on the mechanical components, but still offers a ton of programs and some cool add-ons such as a handy iPod plug-in port. The AFG 5.1 AT treadmill has LED feedback windows and an 8-digit alphanumeric display showing workout stats plus date and time. The pre-set programs you get are Manual, Speed Intervals, Peak Intervals, Stamina Builder, Weight Loss, Foot Hills, Mountain Climb, Golf Course, and Custom 1and 2. Unit Weight/Dimensions — 266 lbs; 84" x 37" x 56"
The AFG 5.1 AT treadmill has a 3.0 hp continuous duty motor backed by a lifetime warranty. Other features include a 500-lb thrust incline motor with a 15% max incline rate, a large 20" x 60" running area, belt speed up to 12 mph, a dual hydraulic lift design for easy folding, built-in speakers and an iPod holder with headphone and input jacks. The manufacturer’s warranty is an extended lifetime on the motor, 5 years on parts, and 2 years of in-home labor. Also on the console is the exclusive proFILE™ performance tracking technology for two users to record and monitor their fitness stats and progress. 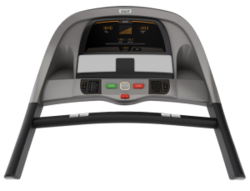 The AFG 5.1 AT treadmill at $1,499 gets high marks in reviews by equipment pros for its outstanding features, programs, and solid treadmill feel – it’s a durable ride at every pace. The motor is quiet, and it has an easy to use console and comfortable deck cushioning. 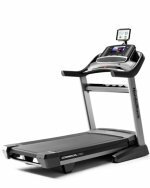 It is comparable to the Livestrong 13.0T for the same price (both brands are made by Johnson Fitness, as are Horizon and Vision treadmills). This AFG is a perfect alternative to the Livestrong, if you don’t want that brand’s Livetrack Interactive tracking feature.